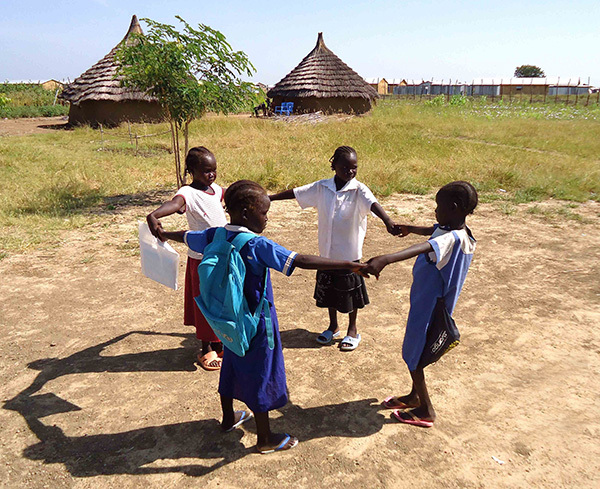 The Raising South Sudan project educates children as a model for community-driven primary schools. Three former Lost Boys of Sudan – James "Lubo" Mijak of Charlotte, NC; Ngor Kur Mayol of Atlanta, GA; and James Manyror, near Denver, CO – have long collaborated and inspired the existence of the Nyarweng and Gumriak primary schools. Today, through nonprofit Mothering Across Continents and supporters of the Raising South Sudan project, these three remarkable young men are able to serve nearly 800 primary school students grades K-8 in Ruweng State, South Sudan. A large number of these children are orphans or children whose families were displaced by past war. Regularly, community and government leaders in Ruweng State describe these schools as essential to maintaining hope for all schools. There have been many accomplishments. Each year, the two schools (Nyarweng and Gumriak) score at or near the top of the state's national exams for 8th grade students. Nearly 40% of students are girls in a part of South Sudan where, historically, only 1% of girls graduate from primary school. An Early Childhood Development program was introduced in 2017. These schools were the first in their area to provide a daily meals program to teachers and students. There are also challenges, too. There was excitement when the former Lost Boys came to the US and received so much attention in 2001, especially. That energy led to independence for South Sudan in 2011 and the opening of the Gumriak and Nyarweng primary schools before and after. Essentials like building repairs, desks, water and more require sustained upkeep until South Sudan is in a position to educate these children without outside support. The Raising South Sudan project is honored to have great friends - individuals, schools, churches, and civic groups including local Rotary Clubs. Each year's operating budget for the two schools is approximately $120,000, including teacher salaries, training, books and materials - all the things that keep general school operations going. Please make a tax-deductible donation, today, and share the story! We are always ready to make a presentation about the impact of education and caring people's support in South Sudan. I donate to support what James and the other lost boys are trying to do. Education (for boys & girls) is a key enabler to break the chain of poverty. Education is the key to so many other paths. Especially pleased at this effort to educate girls in South Sudan. The Men's Group at my church, Covenant Presbyterian, has had you all speak at our monthly breakfast. Since then, I have contributed.